You twitter peeps got a preview already! Lately Eh has decided that the cabinet we currently store towels and cutting boards in is hers. She pulls everything out and climbs in. Some days she just shoves her toys in there. 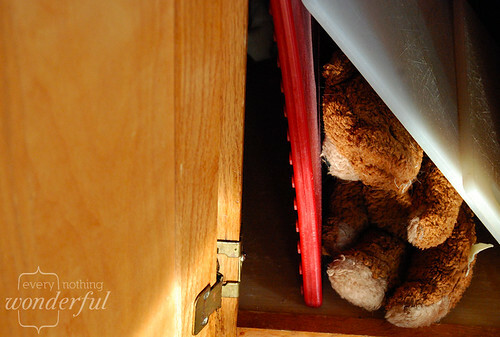 The other day I discovered her lovey, that was her father's lovey, tucked away for safe keeping in her favorite place. Love in everything and every place and best when unexpected.